I was up before dawn broke this morning to be a photography student. It was nothing like when I last studied. No dragging myself out to a tutorial 40 miles away with someone who as a part time tutor knew about as much about the topic as I did. I just opened up my laptop and there was one of the world’s top photographers in my house beamed across the internet from Seattle. It was a surreal experience but worth the eye bleary effort. I’m a bit of a fan of David duChemin and been reading his blog for a while and read some of his books. I finally found a photographer that talked about the art and craft of photography rather than the technicalities and proclamations of a camera geek. The opportunity of a free online photography workshop with him was too good to miss, even if it did start at 0600 NZ time. He talked about finding your vision as a photographer – what moves you, what are you trying to say. Even if the weather and light was co-operative, my tired mind and body wasn’t up for an inspiring photography walk today but I did start to look around me on my basset walk today for things that caught my eye. Mostly I was taken by the way the gorse is taking over the lanes around us. Gorse is top of mind right now as we’ve started another round of gorse harvest. Although I don’t think kindly of this pesky weed it’s amazing how much more you can see when you look for what else is there. Definitely worth getting up for! And I love the gorse in Devon & Cornwall. That looks just like our summer weather. 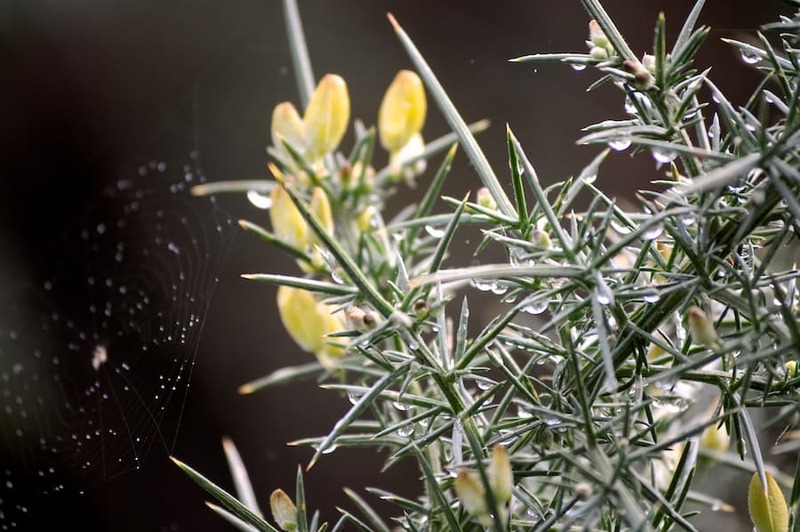 Did you know that gorse flowers smell like coconut oil? It took me 50 years to find that one out.